Wedge-tailed eagles (Aquila audax) are Australia's largest bird of prey. They have heavily feathered legs, a long diamond shaped tail with a wedge tip and fingered wing tips. The wedge-tailed eagle has sophisticated binocular vision which enables them to accurately assess distances and pinpoint their prey. Their eyes also are equipped with bony rings which can squeeze and elongate the eyeball. This has the same effect as a telephoto lens on a camera. It enlarges the image seen by the bird. They have a poor sense of smell and taste. Wedge-tailed eagles use the updrafts of thermals or hill slopes to rise effortlessly rarely needing to flap their huge wings. They soar very high in great circles. Pairs often engage in aerobatic displays to advertise their territory to competitors. Wedge-tailed eagles tend to nest on the sides of the ranges in tall gum trees and hunt in the open desert woodlands. 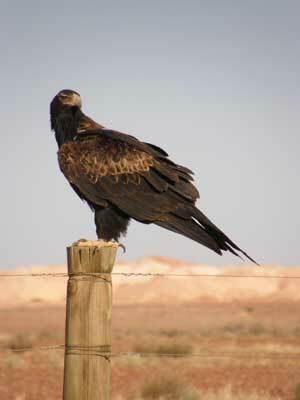 Wedge-tailed eagles are common in open country. Until as recently as the 1960s Australia’s largest eagle was condemned and ruthlessly persecuted as a threat to lambs and sheep. Seeing the birds picking at carcasses led graziers to assume they were responsible for killing the stock. Research established that wedge-tailed eagles hardly ever attack fit lambs, let alone full-grown sheep. Wedge-tailed eagles are powerful hunters. They use their strong, sharp claws and pointed beak to tear their prey apart. They like fresh meat (rabbits, young kangaroos (joeys) and large lizards) but are also scavengers of carrion and are often seen along highways feeding on road kill. Eagle chicks are preyed on by black-breasted buzzards, dingoes and feral cats. Cars kill many eagles scavenging on road kill. Wingspan ranges from 1.8 to 2.5m. Females weigh 4.2kg and males 3.2kg.